The road to recovery when you have or have had someone in your life with Borderline Personality Disorder requires a wide variety and wide scope of information that can help you to gain further insight and to build more awareness, and open up to information that can help you move forward. This Audio Program provides you with a guide to what is involved in getting past “focusing on the borderline” – re-traumatizing yourself which can keep you stuck in the pain and confusion of what is a less well-known self for many in relating to people with BPD. 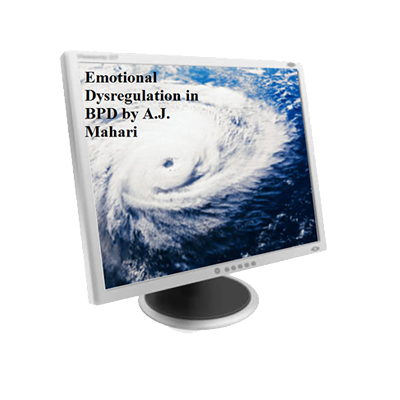 It is not aimed only specifically at those Loved Ones of BPD but there is much you can gain and learn from listening to about many of the issues that are relevant to your experience and issues, skills, and tools that you will benefit from learning more about. This audio program by Life Coach, BPD and Mental Health Coach, A.J. 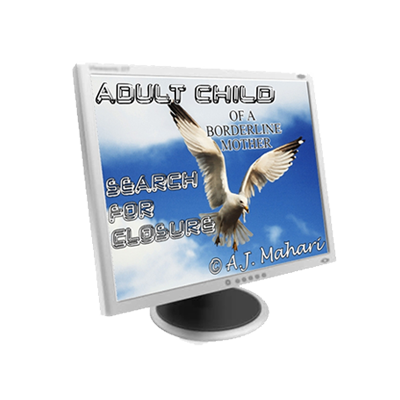 Mahari is very much geared to any person really who wants to create positive healthy change in his or her life. In this audio program along with a general focus on self help and self improvement A.J. 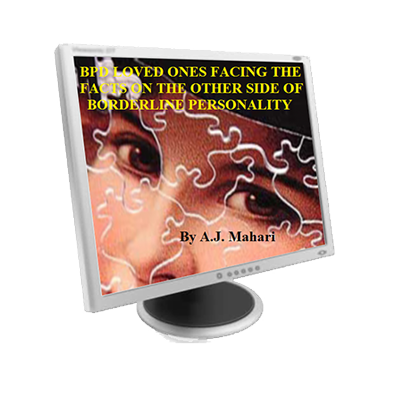 Mahari also references how those diagnosed with Borderline Personality Disorder (BPD) and/or BPD Loved Ones, anyone who has other forms of mental illness or who has been sexually abused can take this journey of healing that is attracting abundance into your life. You can go from the abyss of seeming nothingness and pain and suffering of mental illness to living your life in more balanced ways – thinking in more balanced ways – that will help you to feel more balanced, know yourself better, and help you attract the abundance in your life that you desire, deserve, and are so worthy of. Motivating, inspiring, and practical Coaching information and tools for you to get on the road to positive healthy change in your life. This audio program has 3 tracks. 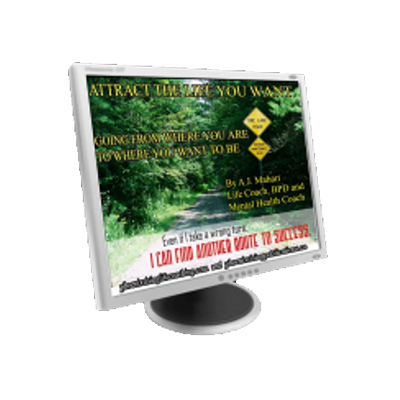 Track 1: 57:29 minutes – Attracting the Life You Desire or want. How can you go from where you are right now to wherever you want to go and be in your life, mental illness, BPD or BPD loved ones, or people with blocks who have issues keeping them stuck in areas of their lives. How to begin to understand how to attract the life you desire by first understanding where you are in your life right now and what about that you do not desire or want. What is keeping you stuck? What is blocking you? What perpetuates your suffering? How can you attract the life you want? What is the life that you desire? Do you know? What is the state of your life right now? Track 2: 43:00 minutes – Your perception is your reality. How important it is to live in the moment and to choose conscious living. Change, personal growth, self improvement, healing, and/or recovery are not straight lines. They are journeys that unfold on winding hilly bumpy highways of life. Don’t let mistakes or what you perceive as failure stop you or slow you down. Mistakes and failures are growth opportunities. Opening up to that fact can motivate so much change. “Success is failure turned inside out” Failures are actually laying the foundation for your success. That’s the silver lining in what is often perceived as the cloud of failure or the cloud of, “I’m not good enough”. For those with mental illness or other emotional challenges it is important to become consciously aware of what your perceptions are because they are forming your reality. It is also important to learn to live in the here-and-now, the present moment in mindful conscious ways. Strengthening your awareness will motivate and inspire you to want change more than you fear it and to attract into your life what you want as you go through the process of going from where you are to where you want to go and be in your life. Track 3: $38:00 minutes – Gratitude, Promises, Mind Altering Tools To Change Your Life, Getting Into the Action to Help you Change Your Life, and Creating and Implementing an Action Plan. In this track A.J. Mahari talks about the afore mentioned and I also outline some of how I work with my coaching clients on getting into action, mind altering tools that will help you change your life and creating and implementing an action plan. Coaching tools that you can apply to your own process or that you can explore further with A.J. Mahari if you decide to book a coaching session or sessions.